Did you know? Linen canvases are woven from special flax that makes it much smoother and free of bumps. Linen canvas whether pre-stretched or not is the canvas of choice for many professional artists. Preferred by the Masters throughout time its smooth surface allows a seamless application of paint and what’s more, a high quality canvas made of linen will make paintings last the test of time by reducing the chances of fading. No two artists are alike some like to glide the paint onto their canvas and others prefer a heavy hand. 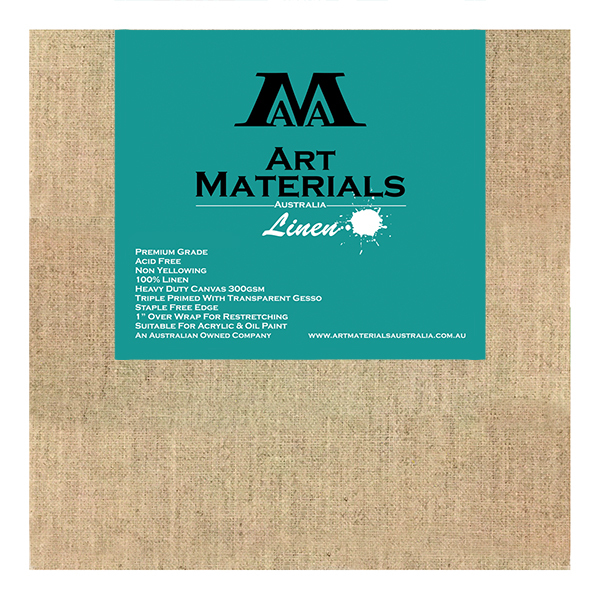 Linen canvas is very durable when it is stretched it will withstand greater pressure from applying paint than a cotton canvas making it the ideal option for artists with heavy hands. It is a very versatile fabric that is delicate and strong at the safe time. Linen canvases are woven from special flax that makes it smoother and free of bumps which makes paint cling to the surface a lot easier than cotton. They are also less likely to absorb moisture, causing them to contract and expand. They are the best canvas choice for those who consider themselves a professional artist. Linen has a notoriety about it and it adds value to your work. Linen is also capable of retaining its natural oils despite the many different canvas sizes that it is available in, which means they are able to last for generations and maintain a natural, high quality canvas texture even years after use. If you can't find a canvas size that suits you, linen is also available in roll lengths. Tip: If you are serious about your artwork use linen canvases, galleries love them.